In my quest to eventually try everything on their menu, I have made two visits so far. The first was for lunch, and then I stopped by another day for some snacks. After this long walk to the restaurant, which is currently TripAdvisor’s #3 restaurant in Fayetteville (the #2 restaurant is now closed), I needed some calories to burn for the return home, so this was going to be another lunch stop. 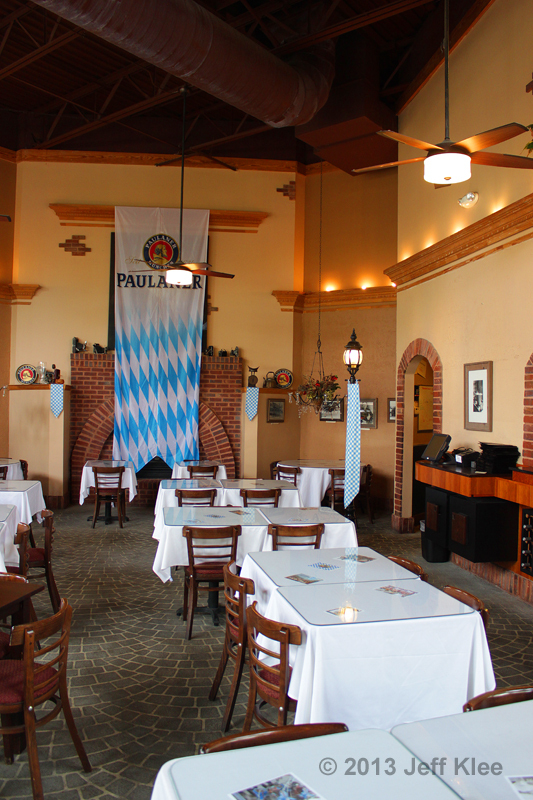 On my last visit, they were celebrating Oktoberfest, and had certain décor changes to reflect the event. At that time there was a huge banner that hung over the fireplace, along with identically colored fabrics hanging on the sides of the mantle and over the lamp posts. There were also several similar decorations hung along the wall and conspicuously placed throughout the interior. 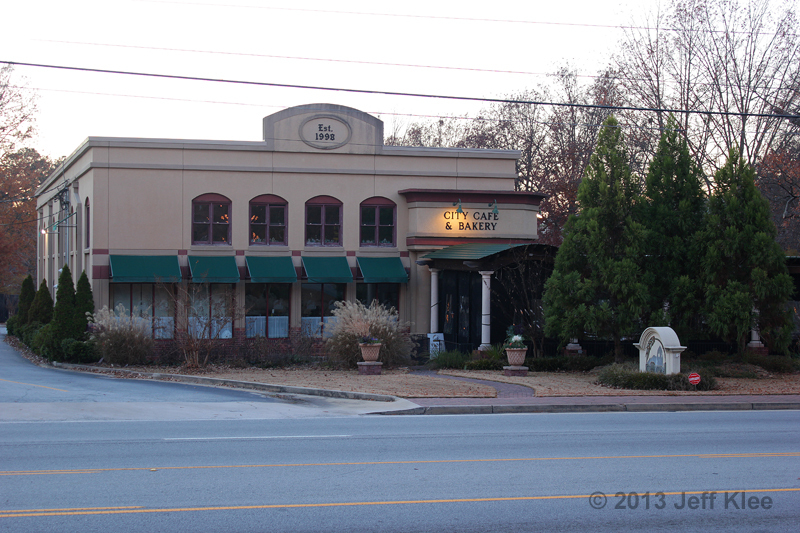 This visit was four months later, and City Cafe was back to looking like its normal self. The fireplace with its rearing horse above is exposed. 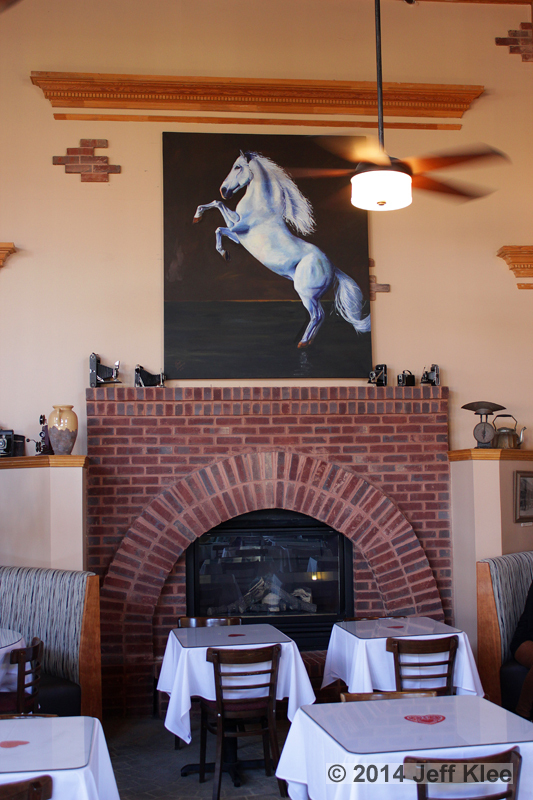 There was no fire going today, but during the colder days of winter, you can hopefully find a cozy table next to the gas fire. 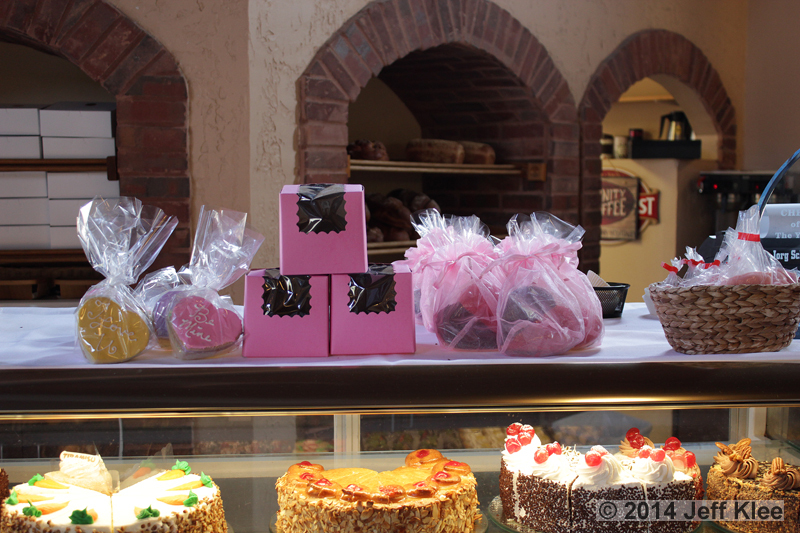 The bakery cases typically remain mostly the same, although certain items may change seasonally. The case on the left usually has cookies on the bottom, and those often change to reflect the current holiday or season. Valentine’s Day had passed, but the case still had some heart shaped cookies, along with others that had the lighter pastels that signified that holiday along with the colors of Spring. The case on the right had cakes on top as it always does, but those change often and some of them also reflect the time of year. The middle and bottom racks have not changed on my visits so far, although today there was a heart shaped “cake” piece in the middle that was also for Valentine’s Day. I inquired about this, and apparently in Germany marzipan pigs are given as New Year presents. They are considered a symbol for “good luck.” Therefore, City Cafe had some individually wrapped marzipan pigs for sale. It was time to browse the menu. 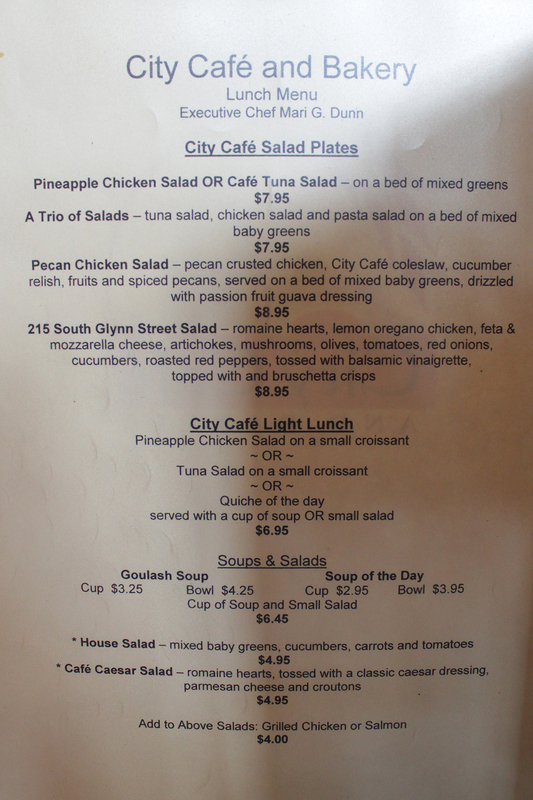 The first page has entrée salads and “light lunch” options that include some small salads, soups, and sandwiches. Page two is where I ordered from last time. 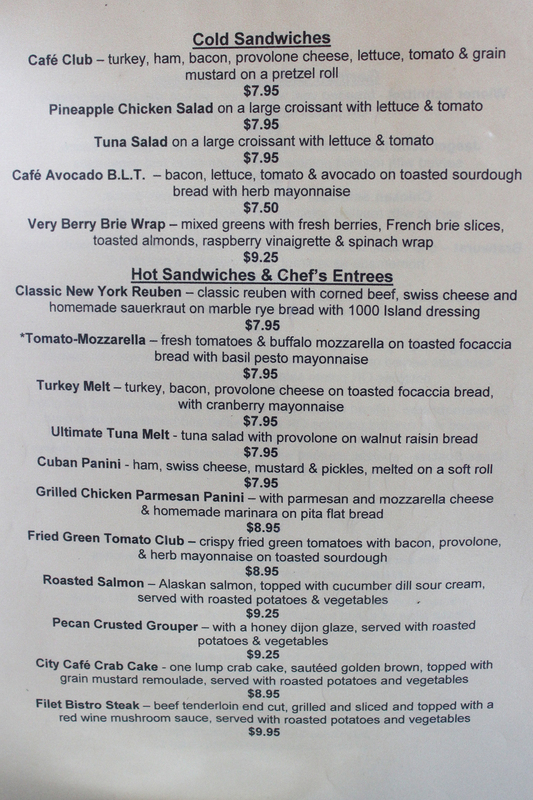 I has the hot and cold sandwiches along with some entrées. The last page has Oktoberfest entrées. On my last visit I thought these were specific to the festivities of the time, but apparently you can order the Oktoberfest entrées any time during the year. At the very bottom of the page are a few side choices. I chose a couple of these for this meal. 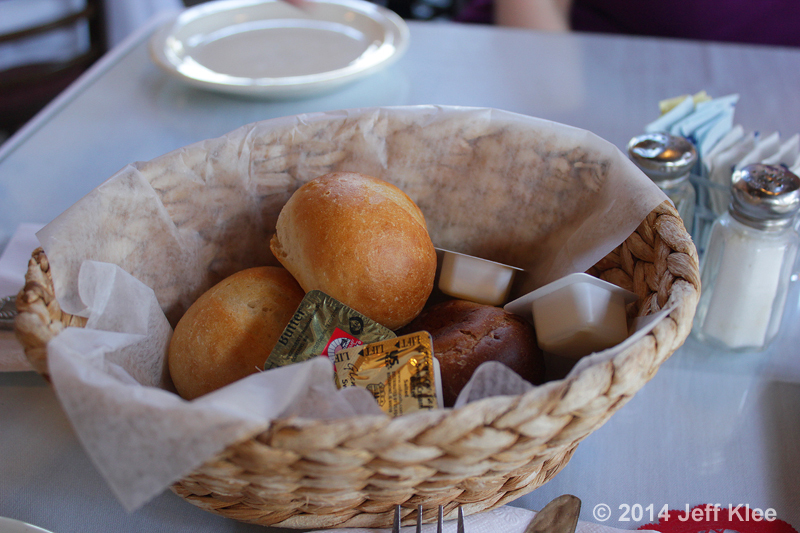 As before, the bread basket was the first item on the table. I reviewed the bread last time and won’t repeat the details, except there was a dark multigrain roll in the basket along with the others. 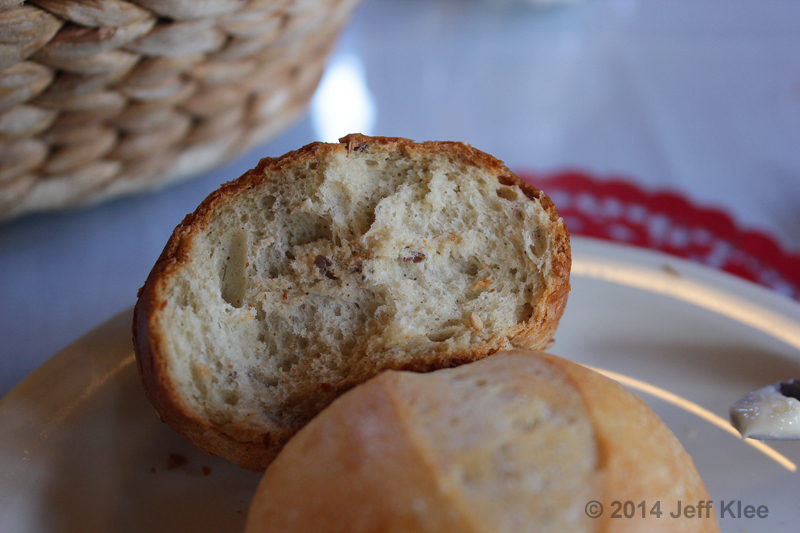 Just like the sourdough rolls, this one was soft on the inside, and had a firmer, chewier exterior. The flavor was good, and today’s rolls seemed even fresher than last time. I once again ordered two entrées, this time both of them were hot. 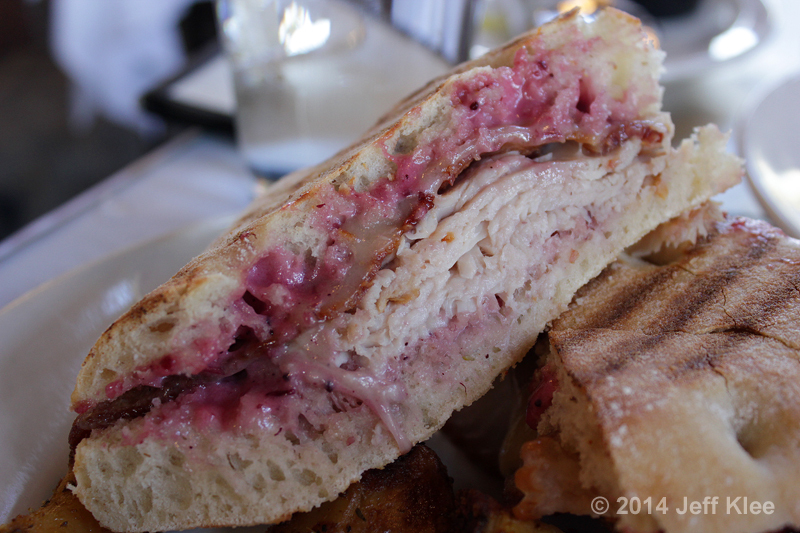 The first was from the hot sandwich section, a Turkey Melt. 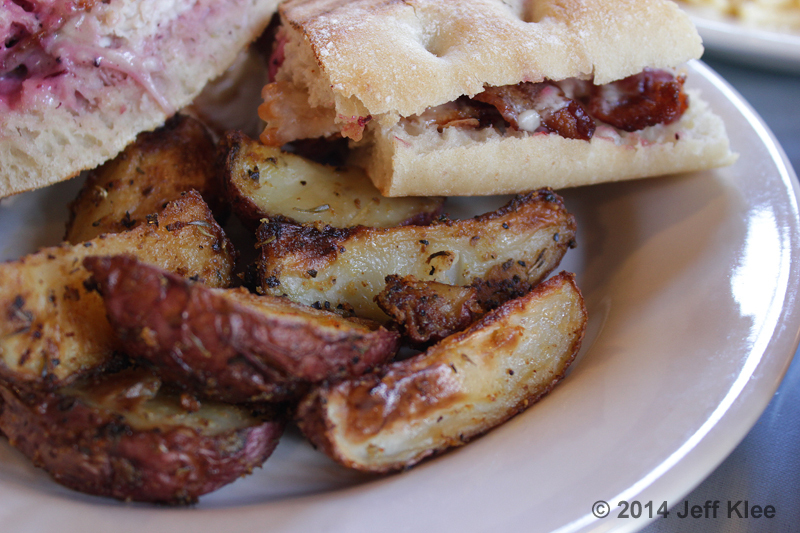 As I figured out last time, all sandwiches come with a side of roasted potatoes. 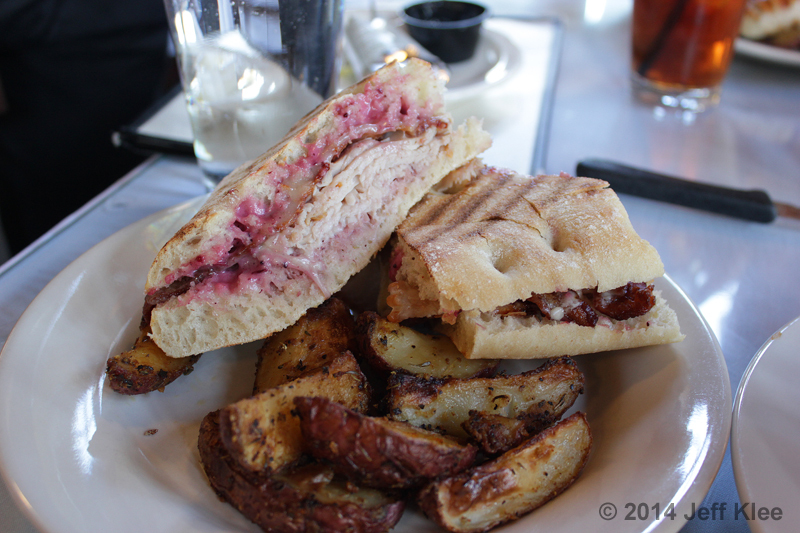 The sandwich had Boar’s Head® turkey, topped with several slices of bacon and then provolone cheese. All of this is wrapped in a well toasted focaccia bun. I loved how crispy the focaccia was from being toasted. That, along with the bacon, gave a wonderful crunch to the sandwich. 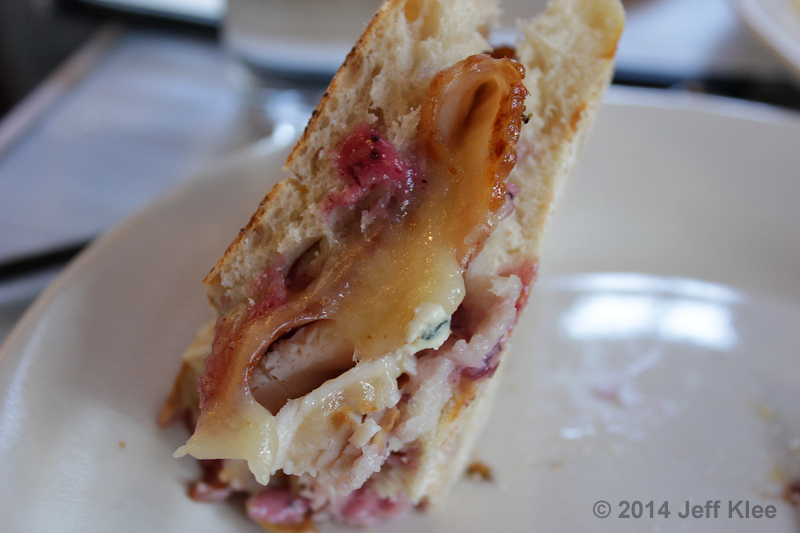 The best part of this sandwich however, was the cranberry mayonnaise spread on top. It gave the whole thing a very sweet taste. It was definitely a unique condiment that I had never had before. 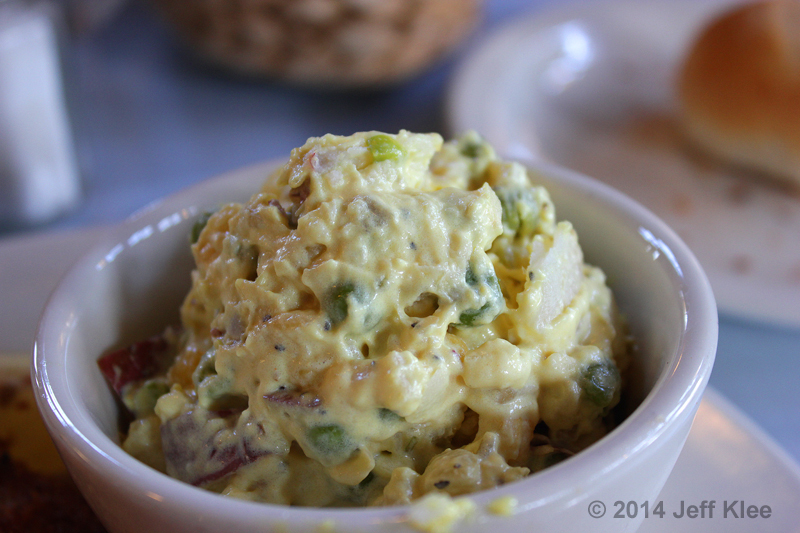 Mixing a sweet mayo with salty bacon was the perfect mix. The potatoes were also really good. I reviewed these previously, and felt the same about them this time around. I learned that they are not pan fried in butter as I guessed on that visit. They are seasoned with Italian seasoning, pepper, garlic, and seasoning salt. Then they are tossed in olive oil and oven baked until crispy. Compliments to the chef for creating such a crispy potato in the oven. It’s not easy to do. There’s a fine line between them being soft, as potatoes become when cooked, and burning them. As before, they were salty (which I like with potatoes) and well seasoned. My next entrée was the Wiener Schnitzel. It comes with vegetables, and my choice of roasted potatoes (which I had on my other plate) or potato salad. I went with the latter. 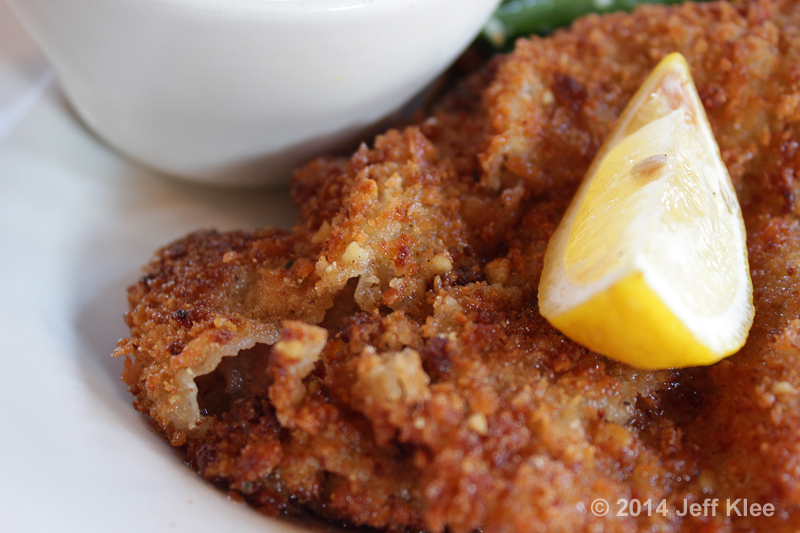 The Wiener Schnitzel was a slice of veal coated with a thick breading, and served with a lemon wedge. It was fried until crispy on the outside. 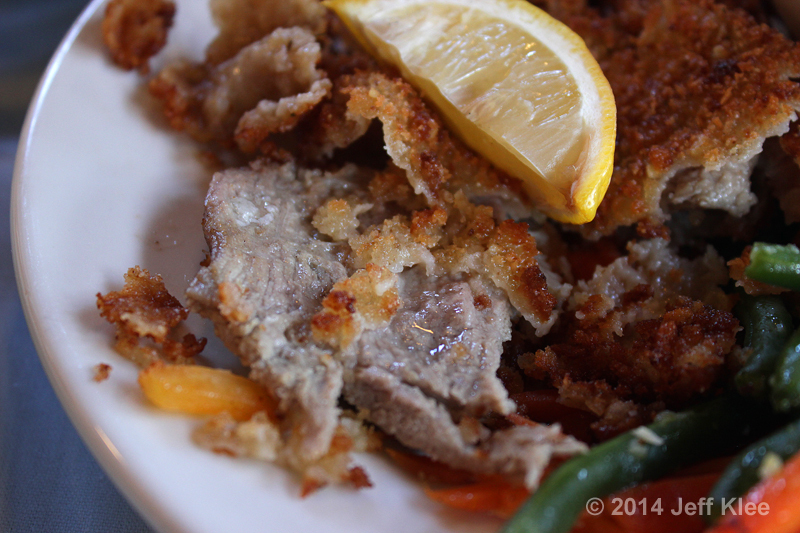 This one had a breaded coating made so well, that the outer layer was staying intact, even while peeling off the meat. The veal was fairly thin, but still large enough for a satisfying meal. Being fried, it was very juicy inside. 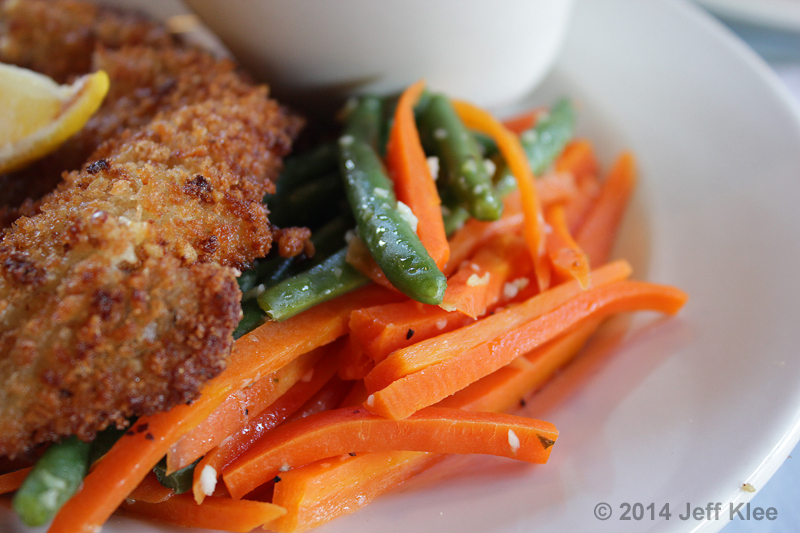 The breading to meat ratio made it tough to taste the veal itself. That could be a good thing or a bad thing depending on your favorite part of breaded proteins. I did like the beans and carrots. They were cooked the way I like them most, where they were still crispy and not soft. I wasn’t able to taste the cheese, which I assumed was Parmesan that was sprinkled on them. 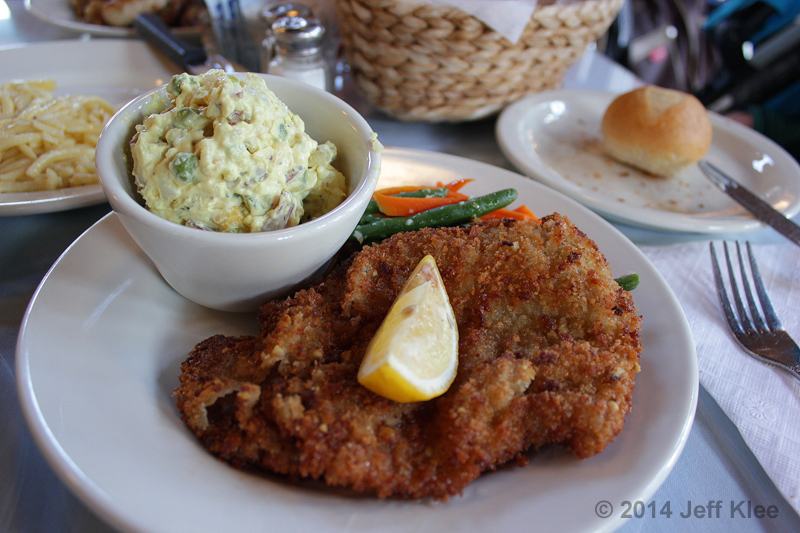 The Wiener Schnitzel was fairly basic, with nothing standing out as special. It didn’t seem to be above any other similar dish I could get at other restaurants. It was cooked well and not dry, so that at least made it enjoyable. The vegetables were good. I like my veggies minimally cooked to keep them nice and crisp, and these were a success for me. 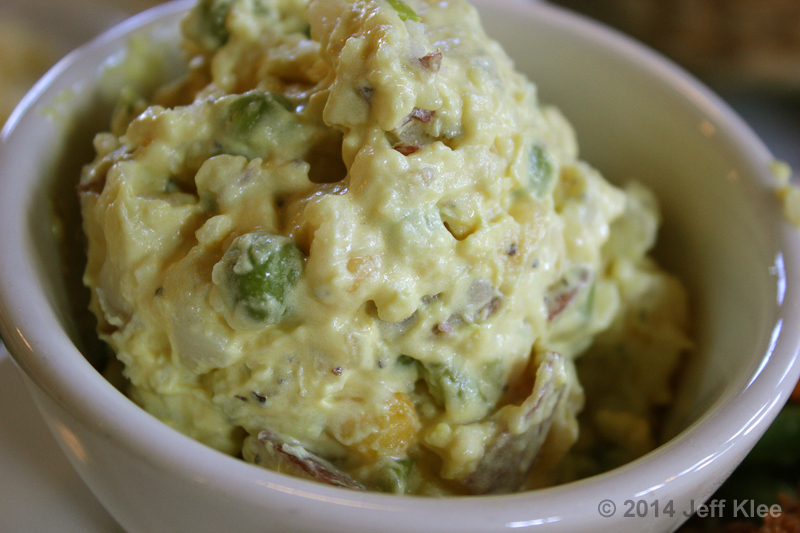 I wanted to review the potato salad separately since it was a choice I made for this meal. On top of that, it’s a side dish that can be ordered from that third page of the menu. This potato salad was very unique. I first noticed that there was a slight crispiness to it. 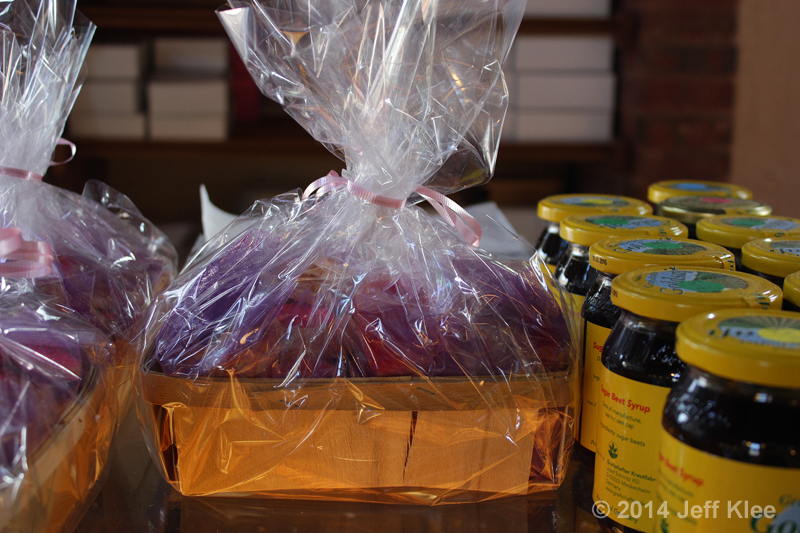 This is due to some unusual ingredients that are part of co-owner Doreen’s mother’s recipe. Those special ingredients included peas, corn, and apple. Some of that crisp was due to the onion, but the rest was thanks to the corn and apple. It was surprising at first, but once I realized that there were foods present here that I hadn’t expected, it was quite a treat. It almost seemed at times that there were more additional ingredients than actual potato. Besides the slight crisp they offered, the apples and corn provided a sweeter taste than normal. They used red potatoes with the skin on for this salad, and they were covered with plenty of the mayonnaise mix. The main part was perfectly fine by itself, but the added special ingredients made this extra delectable. I ordered one extra side dish to go with my meal. 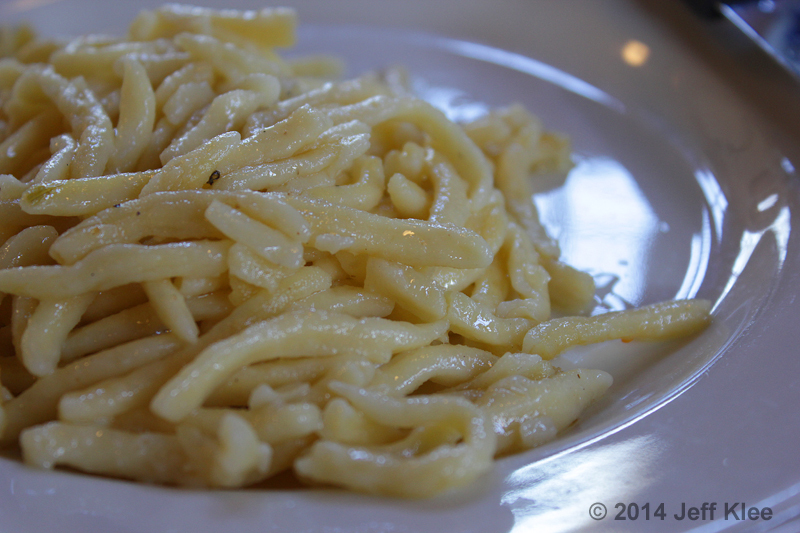 Spätzle is simply a type of egg noodle that’s commonly found in certain parts of Europe. 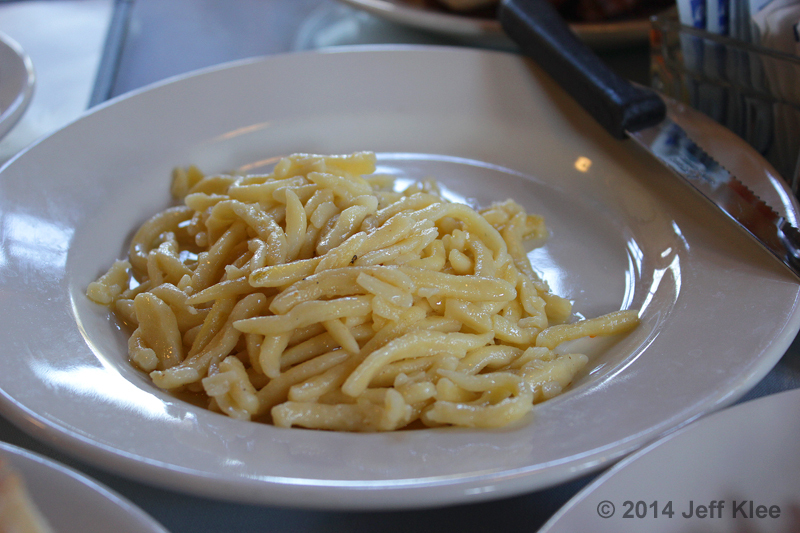 This spätzle was cooked al dente, and then covered in butter for that old buttered noodle favorite that I remember from childhood. There’s not much else to this side, just noodles and butter. Sometimes simple is the way to go. I should have been done with my meal, but my wife had gotten a pretzel roll with her entrée and of course it was handed over to the gluten eater in the family. 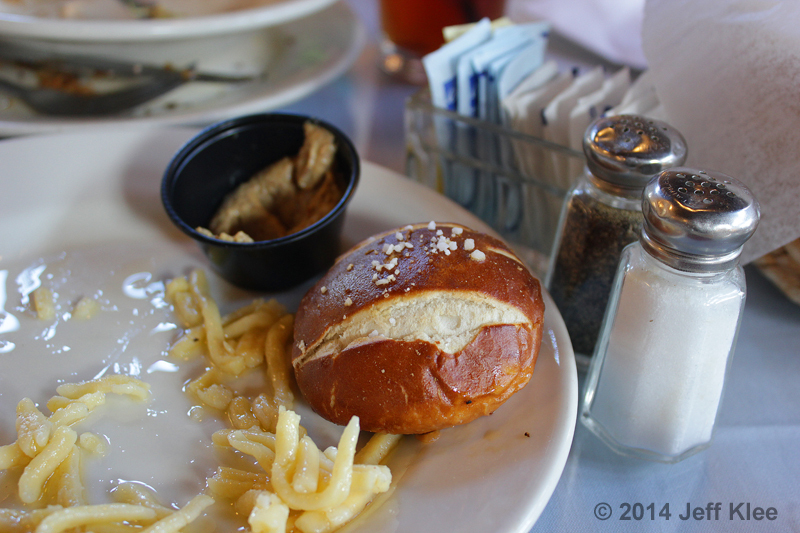 It was similar to the pretzel bread that I had on my Café Club during the first visit. The roll was soft, and tasted just as great as any soft pretzel you’d find from a street vendor or mall kiosk, minus the buttery coating. 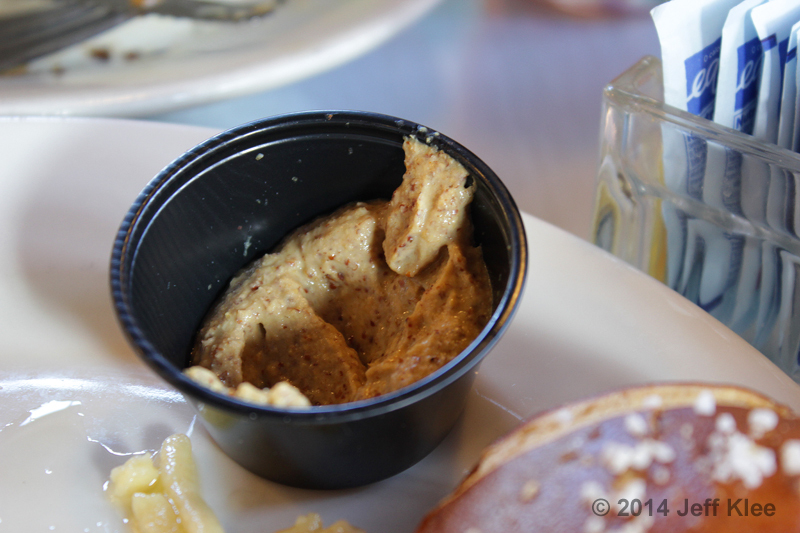 It came with a cup of spicy mustard for dipping, which my wife warned me was probably too hot for my liking. She was right. It was quite spicy, and I was only able to put a drop on each bite to avoid burning my sensitive tongue. I ate most of the roll with no add-ons, and was perfectly happy with it just the way it was. 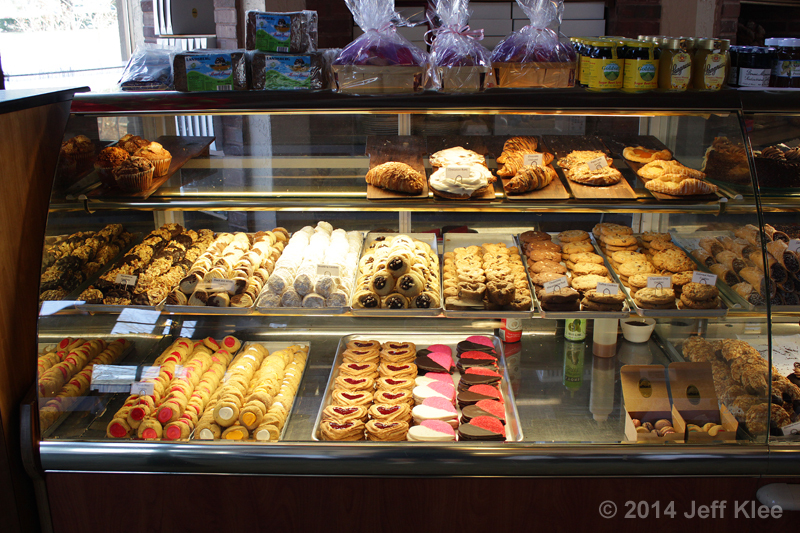 It was finally time for dessert, so once again I moseyed up to the bakery cases to make my choices. I decided to try a couple temporary desserts along with some long standing classics. 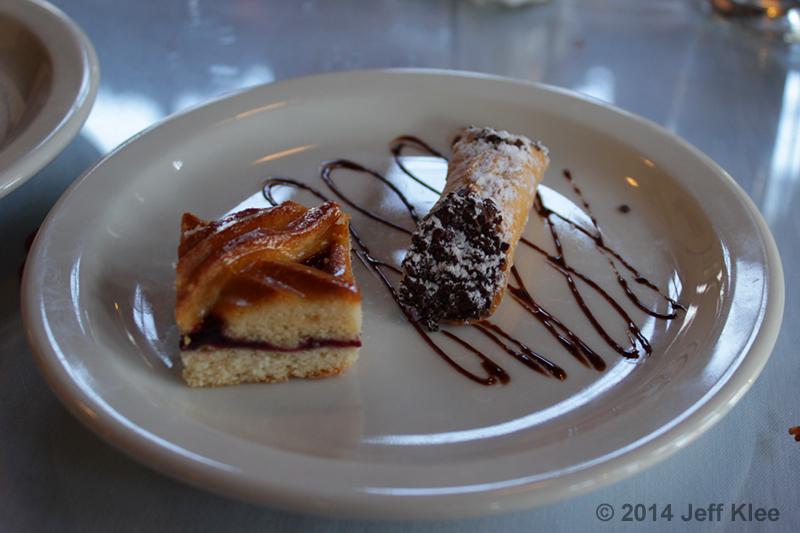 The first plate had a Linzer bar and a cannolo (which is in fact the correct singular form of cannoli). At an employee’s recommendation, I chose one of the mini cannoli. I was told that because of its smaller size, it would have a different taste due to the ratio of filling versus outer casing. She was right, the smaller cannolo still had a crunchy outer casing, but it surrounded less of the cream filling inside. This made it crunchier overall. I’ve complained in the past about cannoli not being sweet enough, so having less of the filling would normally be a positive. This one didn’t have that problem though. It was very sweet all around; the outer shell, the filling, even the vast amount of powdered sugar covering the outside. I really liked this one. Since I generally am not impressed with cannoli, this may have been one of the better ones I’ve had. 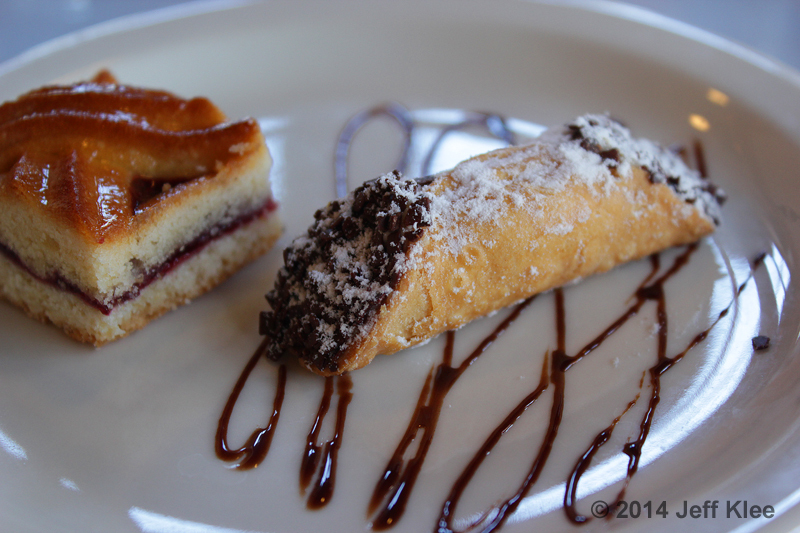 The cannolo sat next to a Linzer bar. 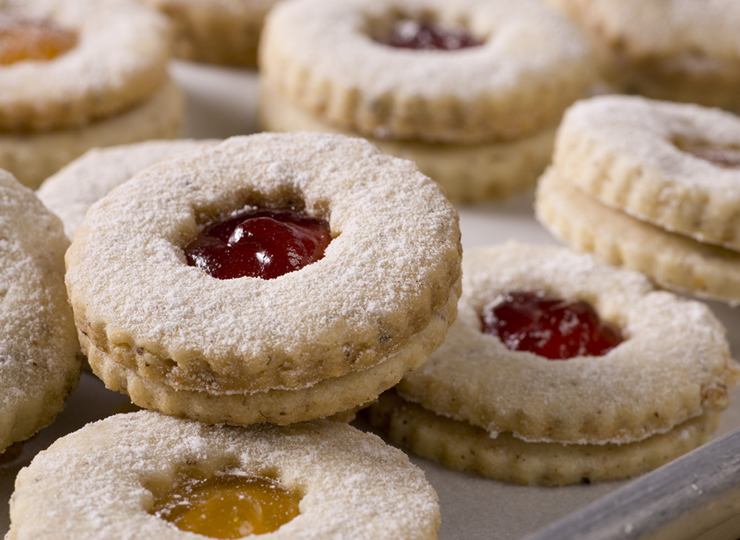 You may be familiar with Linzer cookies, which are the little nut cookies usually sandwiched around raspberry or other fruit jam that look like the one below. 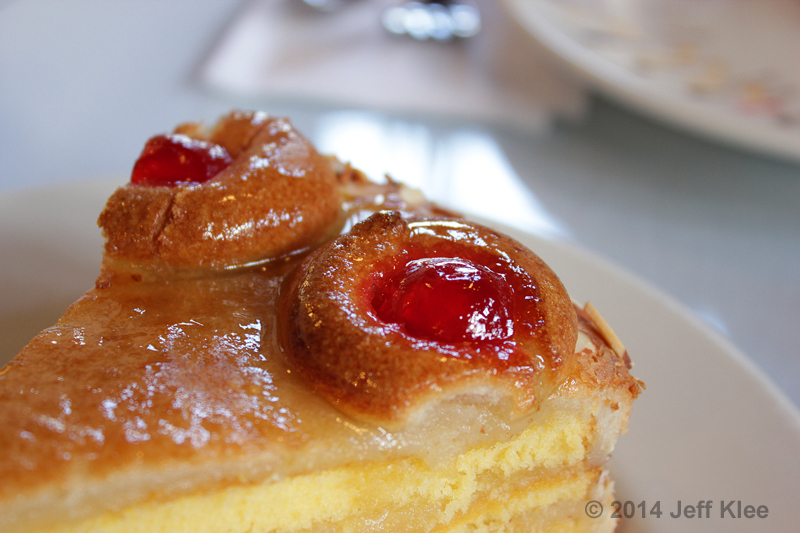 The Linzer bar from City Cafe was made similarly, although in a bar form. Made a little thicker than a cookie, it still had a firmer texture, and was crumbly like the cookies. This one used the common almond flavor as the main base and raspberry as the filling. 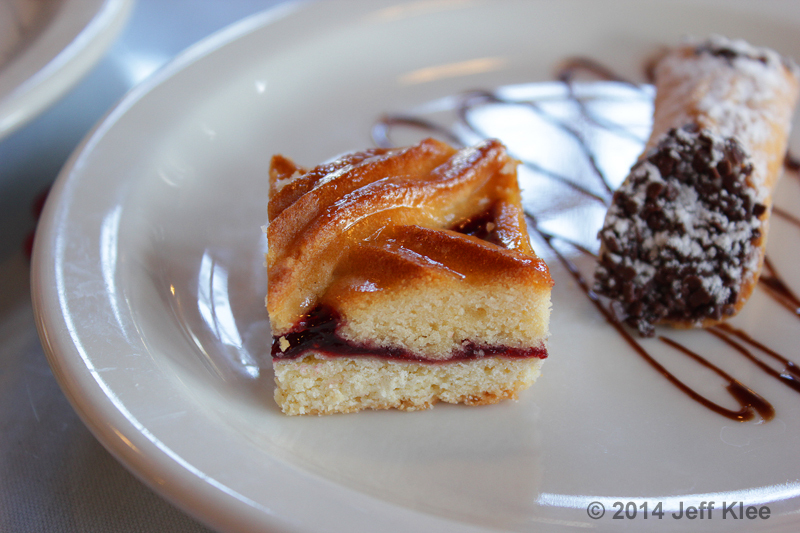 I’ve never put Linzer treats as a favorite dessert. I think they’re okay, but usually prefer other options when they’re offered. This was no exception. I also picked up a heart shaped petit four. 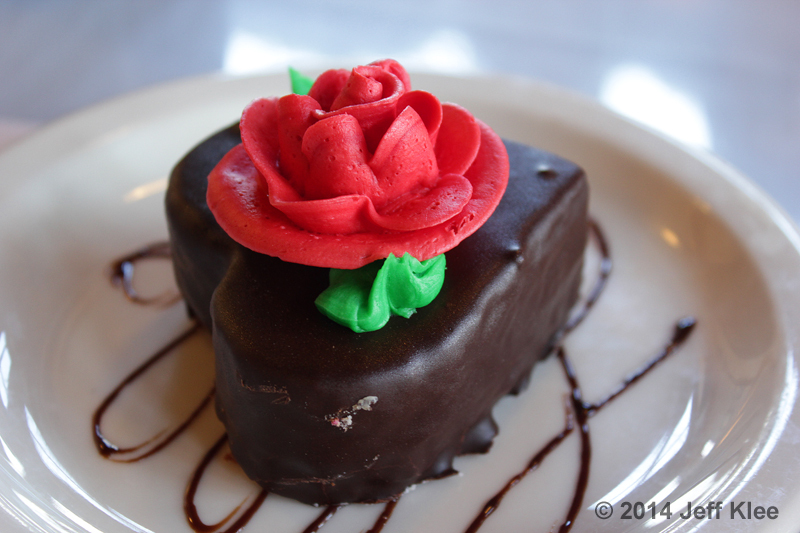 Shaped for the Valentine’s Day holiday, this petit four had an outer soft chocolate shell, and a pink frosting flower on top. 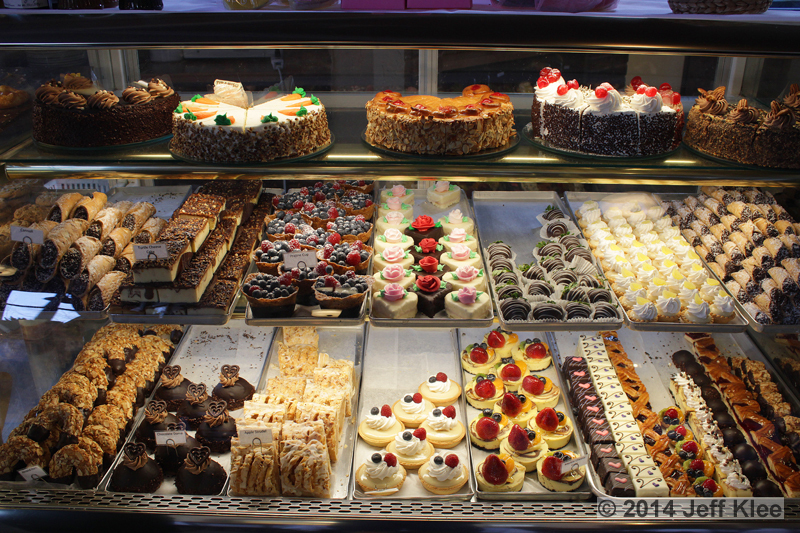 I had two choices from the pastry case. 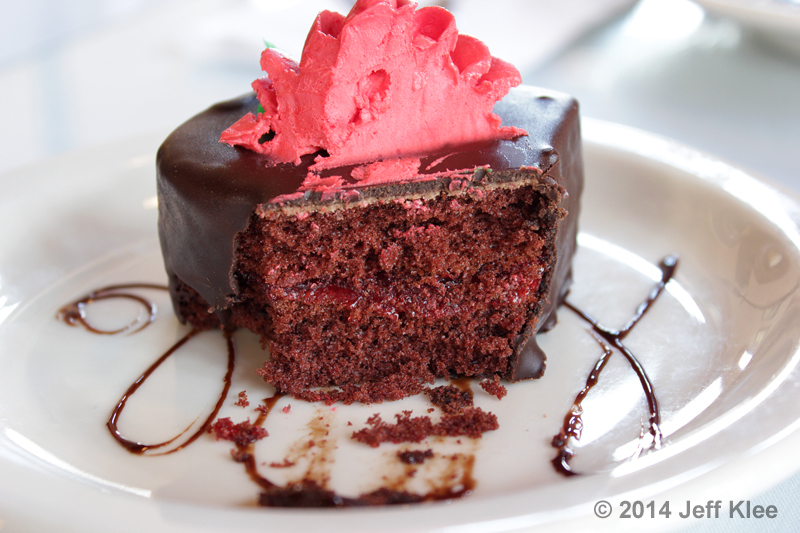 One was a yellow cake with orange filling, and I picked the other, which was chocolate cake with raspberry filling. The cake was somewhat bland, definitely light on the chocolate flavor. 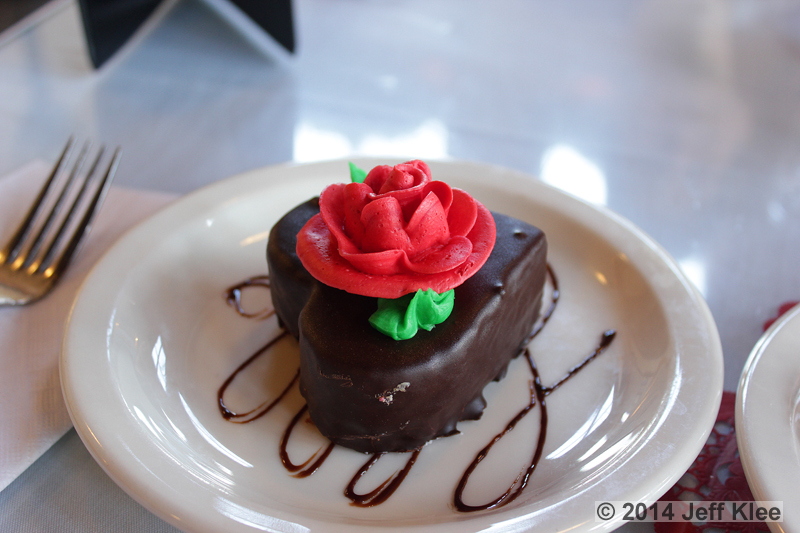 The thick butter cream flower on top was the opposite, with a heavy, sweet flavor that I really enjoyed. The chocolate coating was decently thick, enough so that I could easily taste it over the larger amounts of cake. That little strip of raspberry in the middle was really a standout. It had a bold raspberry drive that was surprising considering its quantity. Normally I’m not interested in lighter, less flavorful cakes, but with the stronger punches from the chocolate coating, frosting, and raspberry filling, I actually took a liking to it. I had to save the best for last. This was a slice of what they called milano cake. 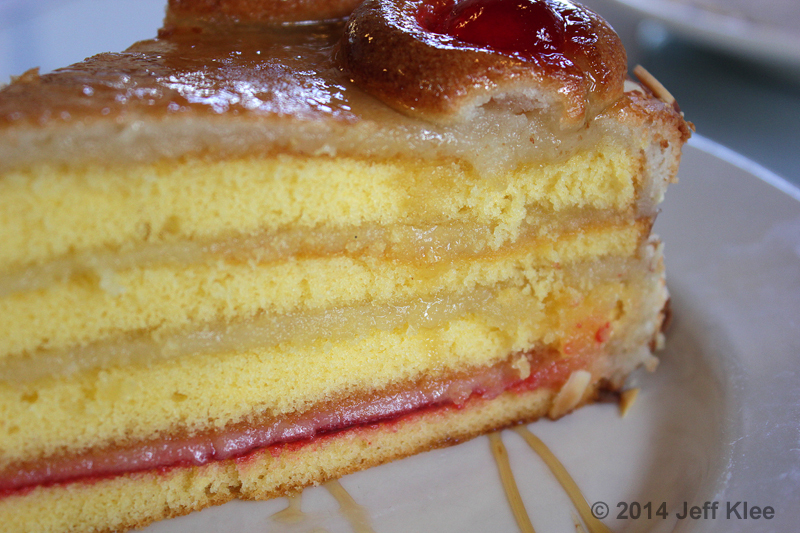 The cake was a four layer, yellow vanilla cake with layers of marzipan and raspberry filling between each layer. Marzipan, which is simply a mix of mostly sugar or honey, and almond meal, has a very sweet, nutty flavor. The top of the cake had a marzipan layer as it’s frosting, and piped marzipan paste surrounding the edges, each with a maraschino cherry placed in the middle. After the top layers are in place, they are firmed up by a second baking. So, how was it you ask? It was absolutely amazing! This may have been the absolute moistest cake I’ve ever had. I would take a bite, and it practically melted in my mouth. The main reason I’ve had a disliking of cakes my whole life was due to them being a dryer dessert. As I’ve had better quality desserts over the years, I’ve experienced some cakes that I’ve really liked, but this was several steps above all of them. As far as taste goes, it was actually very much like the Linzer bar (also made from marzipan), although in cake form, so it was much bigger, and quite a bit softer. I could taste the marzipan for sure, but all flavors were evident. 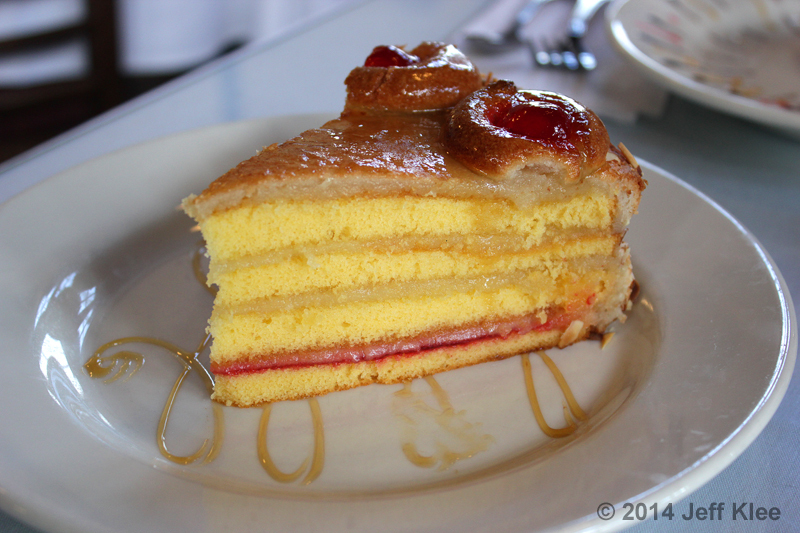 Our server explained the cake’s taste perfectly by saying “it tastes like amaretto smells, but not how amaretto tastes.” There were the maraschino cherries on the top, and the one layer of fruit filling on the bottom layer. That bottom layer I was told had a raspberry filling along with the marzipan filling. Upon eating it, I was very sure it was a cherry filling, but I don’t know if my palate was mistaken, or if the employee was incorrect in her information. Either way, I love both flavors, so I thought it was perfect. To top it off, the usual sweet drizzle, this time caramel, was squiggled across the plate. This gave it an unnecessary, but very welcome additional sweetness. 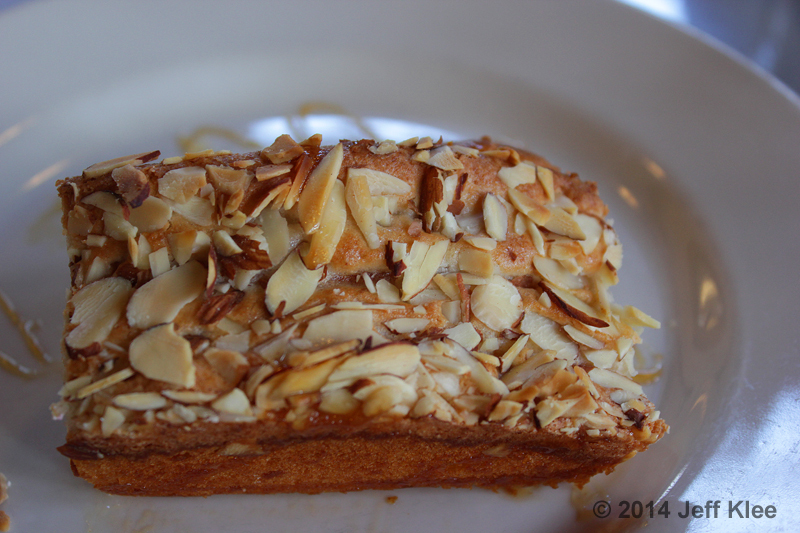 The “crust”, which again was just a firmer layer of marzipan, was fully covered with sliced almonds on the outside. As I’ve said, I’m not big on nuts with my desserts, but it hardly made a dent in my liking of this excellent cake. Plus, the almonds sort of complimented the flavor of the marzipan (made out of almonds, remember?) that was layered all over this cake. This was a very surprising finish to my meal. I was amazed that I liked the cake so much, but was happy to find a place that can make cakes taste so good and keep them so incredibly moist. If they have this in the case again, I’ll probably have to order another slice. 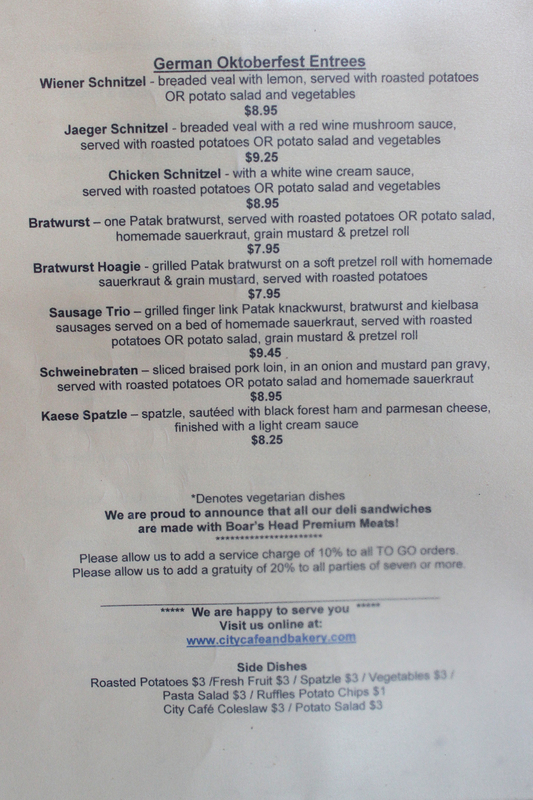 I had another enjoyable meal at City Cafe that left me wanting to come back. As a whole, the food here never disappoints me. I will occasionally find some food that I may not like, that is inevitable when I’m eating everything on their menu. There will be items that I know I won’t like as much because their main ingredients may not be favorites of mine, but that’s okay. I’m happy to give them a shot. It gives me a chance to expand my palate, try new things, and possibly learn to appreciate certain flavors. This day’s samples were really good. I love the sandwiches here, and they managed to surprise me by making one of the best cakes I’ve tried. It’s been great eating foods from the country of my family’s heritage. These are foods I grew up with, but haven’t eaten in a long time (mom no longer cooks for me every day). I still have a long list of hot and cold sandwiches, along with several entrées to go, and I’m already itching to get back and continue trying everything they have to offer. See the next installment for City Cafe here.